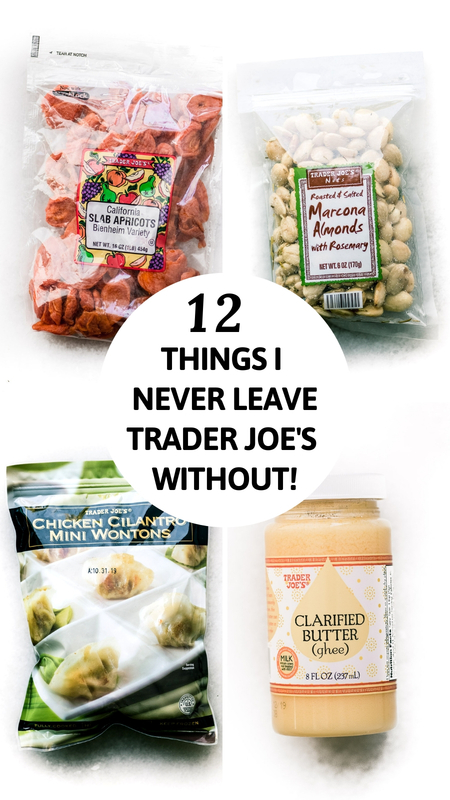 12 Things I Never Leave Trader Joe’s Without ~ TJs sparks foodie passions like no other store, and our favorites list is as unique as our fingerprints. How does my list match up with yours? ~I pick this up right as I enter the store so I won’t forget, and I put it right up front in my cart so it doesn’t get squished. I’ve talked before about what a great deal living herbs are. 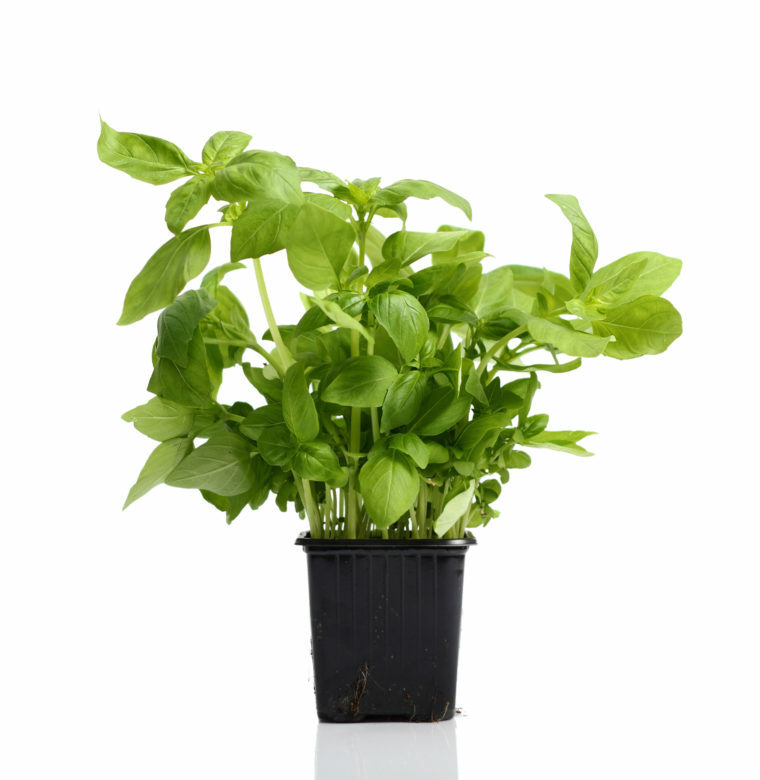 Prepackaged herbs last only a few days, but a plant can go on for a month or more! (And Trader Joe’s basil plant is bigger than those in grocery stores.) It brightens up my kitchen counter and I love being able to snip off perfect basil leaves whenever I need them. My Basil Marinated Mozzarella with Summer Tomatoes and Easy Whitefish with Burst Cherry Tomatoes and Basil wouldn’t be the same without it. ~ these little wontons have fabulous texture and flavor. You can fry them up like potstickers and serve with an easy dip of Tamari sauce and rice wine vinegar, or you can make a super quick soup like I did with my Miso Wonton Soup. 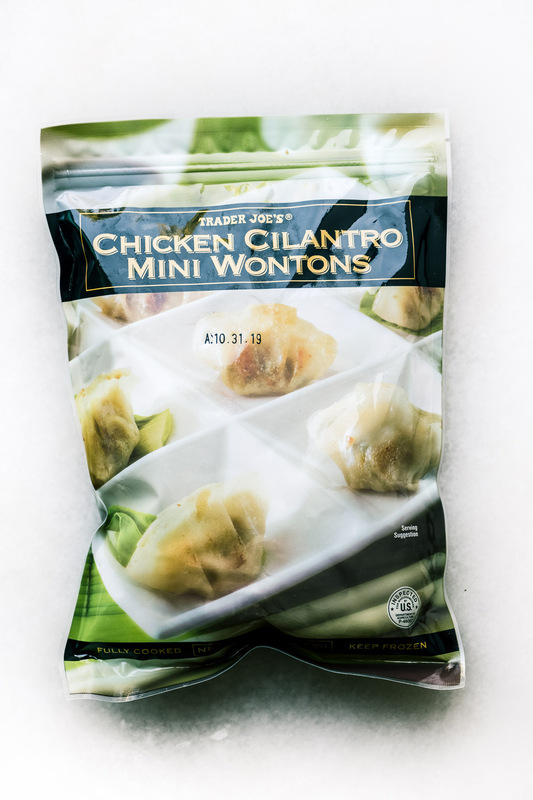 They’re a secret weapon in your freezer for quick meals. ~ there’s something about popping open hot salted pods of edamame beans that is so satisfying, I get a rhythm going and pretty much don’t stop till they’re gone. (I can create a mound of empty pods in record time.) But edamame beans are healthy, so I don’t feel too bad. I actually prefer the un-cooked version of these pods, but they were out the day I shopped. TJs also sells these beans shelled, too, ready to use in salads like my Tortellini Salad with Artichokes and Edamame. ~ oh how I love these! Apricots are my favorite dried fruit and slabs are the ultimate. They may not look as pretty but they more than make up for it in flavor and texture. 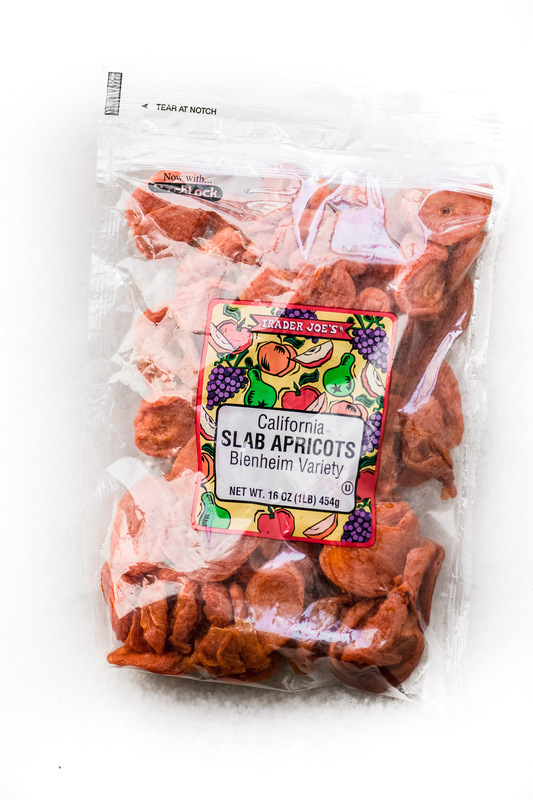 Slab apricots are the sweetest and most intensely flavored of all dried apricots, and also the moistest. What exactly is a slab apricot? These are apricots that are picked fully ripe (i.e. at the peak of flavor) and so soft that they don’t hold their shape when cut and dried. Nirvana!! I bake them up in my Paleo Fruit and Nut Bread, or stir them into granolas and breakfast bowls. But one of the prettiest ways to show them off is in a jeweled rice or tabbouleh. 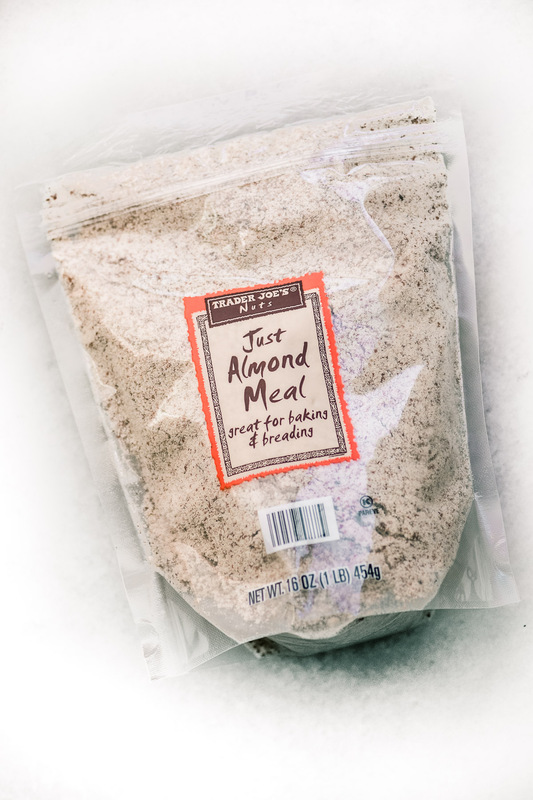 ~ Trader Joe’s carries almond and hazelnut meals, which are so useful in so many recipes. I grab a few bags and pop them right in the freezer so they’ll stay fresh. They also sell Almond Flour, and I’ll use them pretty much interchangeably. 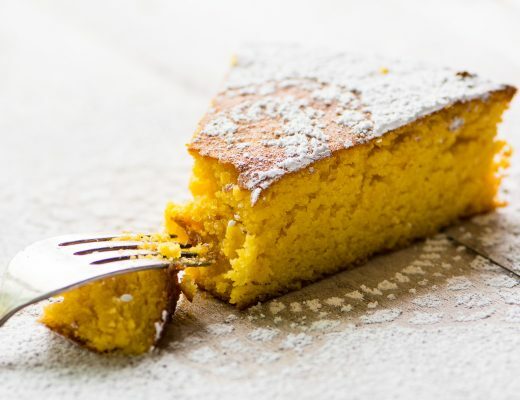 It’s what makes my Flourless Warm Lemon Pudding Cakes, Flourless Belgian Chocolate Cake, and Flourless Tangerine Cake so deliciously gluten free. 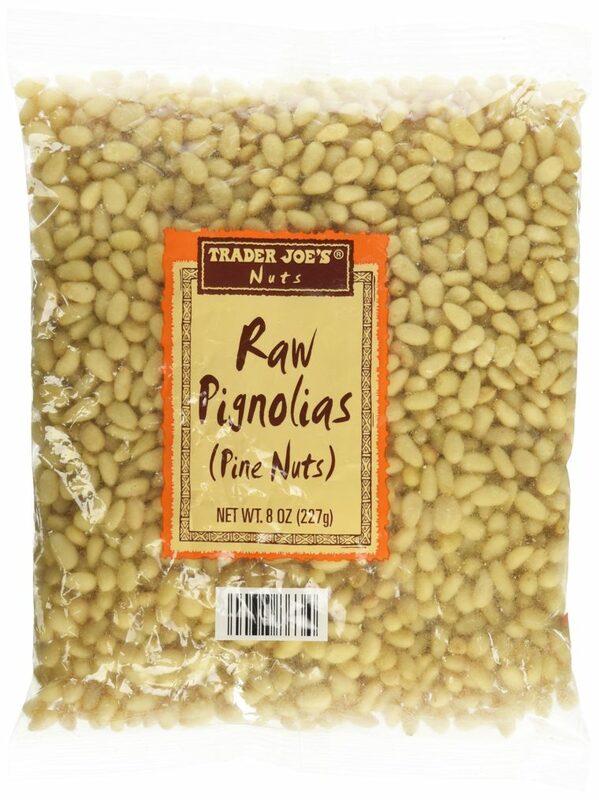 ~ Trader Joes has the best deal on pine nuts, which can be expensive and hard to find. When I do find them in other stores they come in ridiculously tiny bags. I always buy multiples at TJs and keep in the freezer. Whenever I’ve got a Mediterranean recipe that needs a little something, I just toss in some pine nuts, toasted of course. 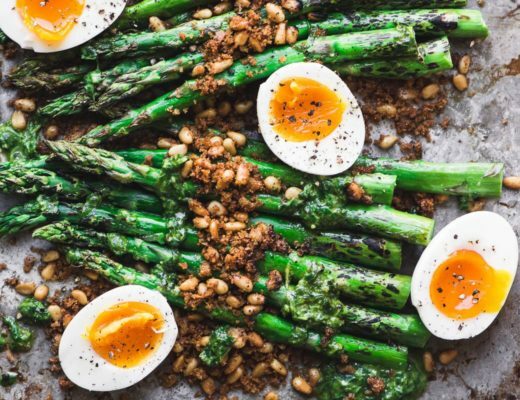 Pine nuts add a special touch to Roasted Asparagus with Crispy Breadcrumbs, Pine Nuts, and Runny Eggs, for instance, and I can’t make on of my favorite pasta dishes, Spaghetti con Pignoli Arrosti (with Roasted Pine Nuts) without a nice big bag like this. ~this is one of the few ingredients I’ll make a special trip to TJs for…it’s hard to source heavy cream that has not been heat treated (ultra-pasteurized) and it’s essential for my Homemade Clotted Cream. ~ Where else are you going to find clarified butter? Because clarified butter has the milk solids removed, it can be used to cook at higher heats, when regular butter would burn. It’s great to have on hand for authentic Indian recipes like my Lemon Chicken Biryani. ~ When I’m not making my own green hot sauce, I make sure to have this one around. It’s hot but not too hot, with lots of jalapeños, tomatillo, vinegar, cilantro, garlic, habaneros, and lime. I love it on eggs. 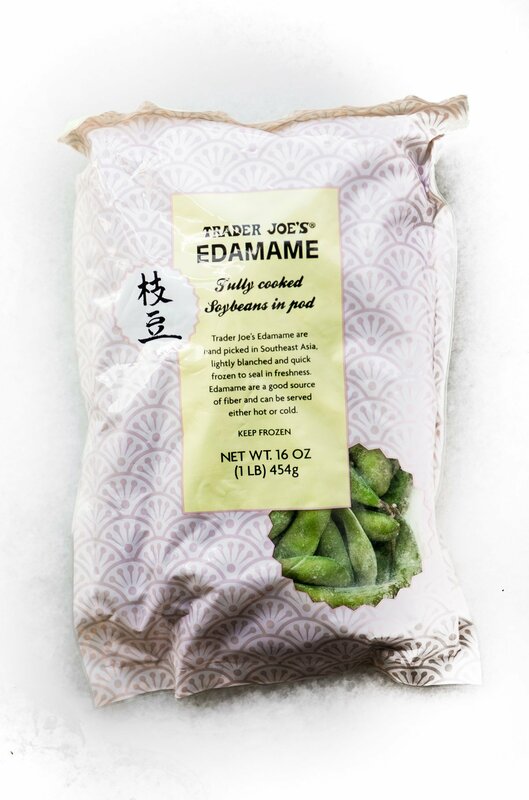 So now it’s your turn ~ what awesome Trader Joe items have I been missing out on?? Trader Joe’s mashed cauliflower! ? Not watery like other brands and a whole bag is just 200 calories. My spouse is frequently away on consultation trips and on cold don’t feel like cooking for one nights, micrwaved mashed cauliflower with shredded parmesan and sauted mushrooms added makes a quick and sooo delicious hot meal. I’m a ginger fanatic, and TJ’s has two ginger items I can’t pass up: ginger turmeric tea and dark chocolate covered candied ginger pieces. We just got our Trader Joe store here two years ago; it was a long time to wait! I’m going to try a few of the items you suggested as well as some listed in the comments. Yum! I haven’t tried either of those and I love ginger too, thanks! This all from the bestly located Trader Joe’s, at Patriot Place next to Gillette Stadium! Go Pats! Just back in before we crash to 5 degrees and -20 wind chills here in Western Pa.
At TJ and got the wontons, almonds, tart and edamame. So that means for the tart I will have to empty out my oven of all the pans I store in there and fire it up! They look so yum. Thanks! lol, I think the tart will be worth it! I wish Tyler Texas had a trader Joe’s.. 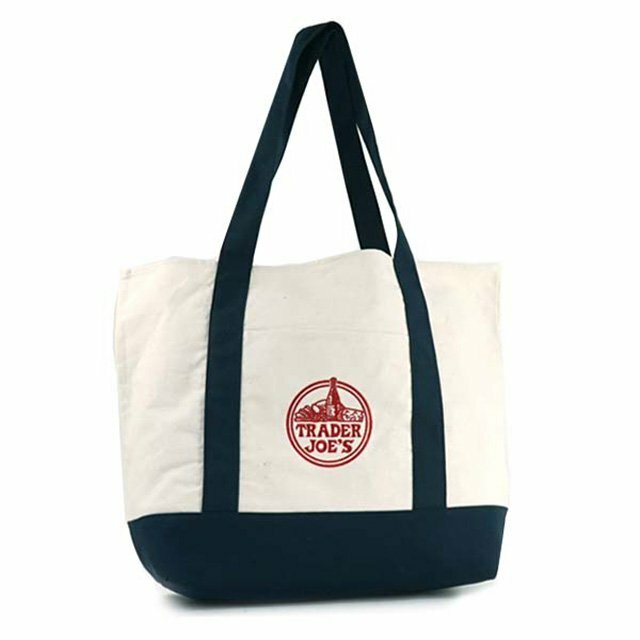 Many thanks for the recommended Top 12 Trader Joe Items, plus your wonderful recipes. We never leave T.J’s w/out 3 bags of Plantain Chips! I always pick up their Greek Feta cheese in the large tub. My husband loves the Thai chile Almonds. Other must haves are Cambazola (sp?) Cheese, their gold label balsamic vinegar, and vine tomatoes. Love their European style plain yogurt too! My regular go 2’s are the: ciabatta bread, banana applesauce, mini beef tacos & thier marinara sauce. Ok, why haven’t I heard about this banana applesauce??? Be certain to mention the frozen garlic cubes!! Frozen sliced leeks. What a time-saver! I used them in stir fry, eggs, and as a side dish with butter. p.s. I live in Portsmouth. First of all, I’m so jealous that you live in Portsmouth, I miss it so much. What an amazing city. Second, I adore leeks, and I’ve never used the frozen, so thanks. …and wouldn’t those frozen leeks be great for a quick potato leek soup? 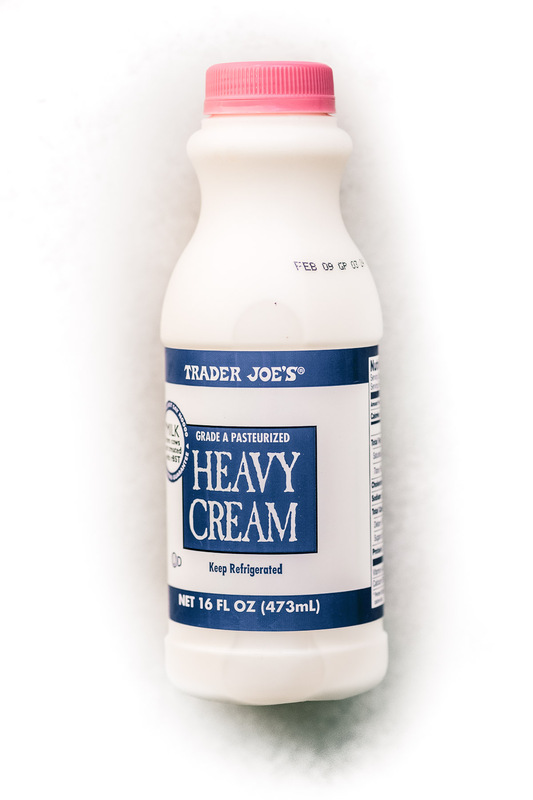 I want to head to Trader Joe’S today for some of that Heavy cream and make clotted cream. It’s only about 15 minutes from me, but parking is a problem. We’re having some chilly weather in our usually hot south Florida today. Seems like a good day to do some cooking! Remember your oven temp is critical with that recipe, so make sure it’s at 180F and good luck! Grocery shopping is a huge pain without a car, and in bad weather to boot. I think all the new delivery services are amazing, I wonder if TJs will ever get on board with that. I can’t believe nobody has suggested TJ’s cilantro-jalapeno hummus. It’s amazing, not too spicy and not an overwhelming cilantro flavor. Paired with their mini pita’s, my hubby and I could finish a whole tub in one sitting. We always buy 3 or 4 and share with hummus loving friends! I’m not sure I’ve ever tried that one, I used to buy their hummus but ever since I started making my own, there was no need ;) I make a pretty good cilantro hummus, it’s on the blog, but I don’t add jalapeño ~ that sounds good! Now I need to go to TJ’s! My family loves the green casserole from the box of TJ’s mushroom soup and frozen green beans. We also love TJs frozen roasted corn off the cob and family dinners like beefl bourgignon. 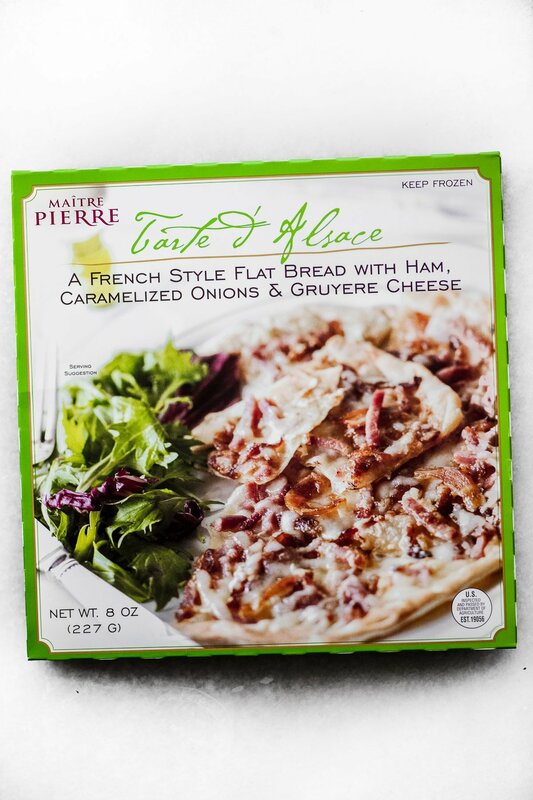 I haven’t tried any of those, but you just reminded me of their individual frozen French onion soups which I love! I wonder if they still sell those? Chipotle Toscana Cheese. Sparkling coconut water with Yuzu. Cold pressed juices green and red. Years ago the special food samples they were giving out was a soup made from a box of the Tomato and roasted red pepper soup (also a low sodium version) combined with a package of Chimichurri rice. It’s not really cooking, it’s combining, but DAMN if isn’t the best soup Ever! I eat it all winter at least once a week combined with a grilled cheese sandwich. I serve this occasionally to friend’s without a word about what I’m doing…essentially nothing…and everyone wants the recipe. So, this is one of the things I never leave TJ’s without! I love recipes that are that simple and delish. 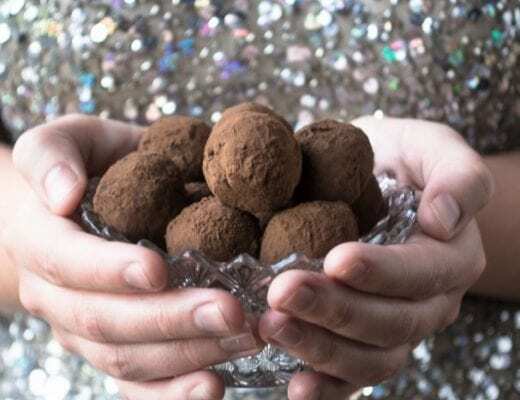 I love that we women are here to do as the article suggests– Share our favorite finds from Trader Joe’s and like the one man to comment has to be rude. J eeze, if you knew anything about TJ’s it’s about getting those little extra specialty items. Dude, let us enjoy our salted dark chocolate almonds!!! Umm, the picture of the heavy cream clearly says pasteurized and that’s the only kind my TJs carries. Right, it’s the ‘ultra-pasteurized’ cream that you usually find in supermarkets, that’s been heated to an extra high temp for longer storage. Pasteurized is the old fashioned kind, and it’s useful for me because I make clotted cream with it. Can you post your recipe for clotted crem? Im’m the Queen of Scones and now I know why my “clotted cream” was off! I used to buy the famous 2 buck chuck, but finally out grew that! Various other goat & sheep cheeses. We usually end up needing more than one basket for our monthly trip. ? This is really helpful, I’m going to copy this and look for these treats tomorrow! For me it’s the goat gouda, the baking cocoa (best price and tastes better than the expensive stuff I have) the Greek olive oil and the organic coconut oil, which I use for cooking as well as skin care. I also use their almond meal to replace half the flour in my baked goods to make them more healthy. Thanks for the post. I drive four hours for TJs. The dried blueberries, low sodium roasted red pepper and tomato soup and 21 seasoning salute are my favorites. Boy, I never realized how lucky I was to have one so close by ~ I imagine you don’t pick up too many freezer items with that drive. 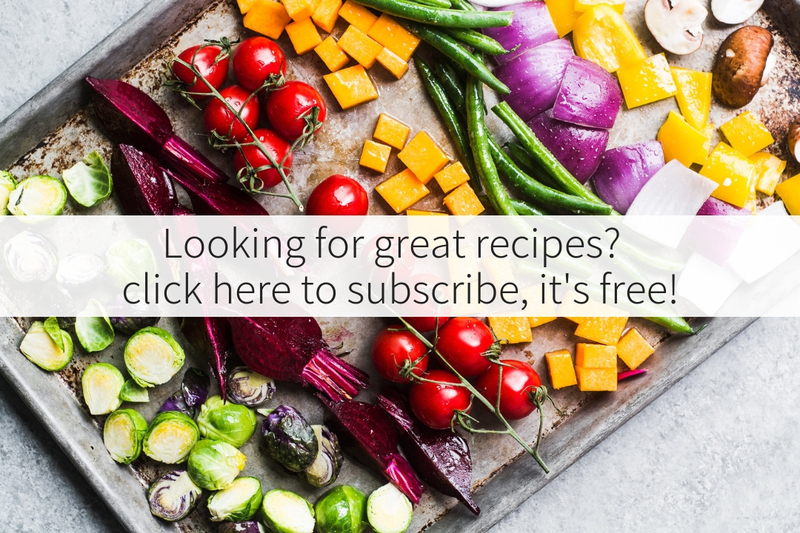 Hi Sue, you have such a great website — so many amazing recipes and so nice of you to share your TJ favorite finds and how you use them in your recipes. Going to add them to my list on my next visit. Thank you! Thanks Roseanne, it’s fun to connect with readers now and again with a post like this. –The frozen Indian foods, like Palak Paneer, chicken samosas, etc. –Something from the meat case that I wouldn’t normally buy at my regular grocery store. This time it was the Tri-tip roast. Love your list, the frozen mac and cheeses are amazing. Have you tried the one with Brie and asparagus? Crunchy Cookie Butter!!! Such a treat! You know I’ve been so late to that party, I’ve got to try it. I too live TJ and drive 75 miles to shop there. I have never tried any of the products you described so I’m really excited to make another trip. Oh gosh, what a long trek, I’m not sure there’s any store I’d go that far for! 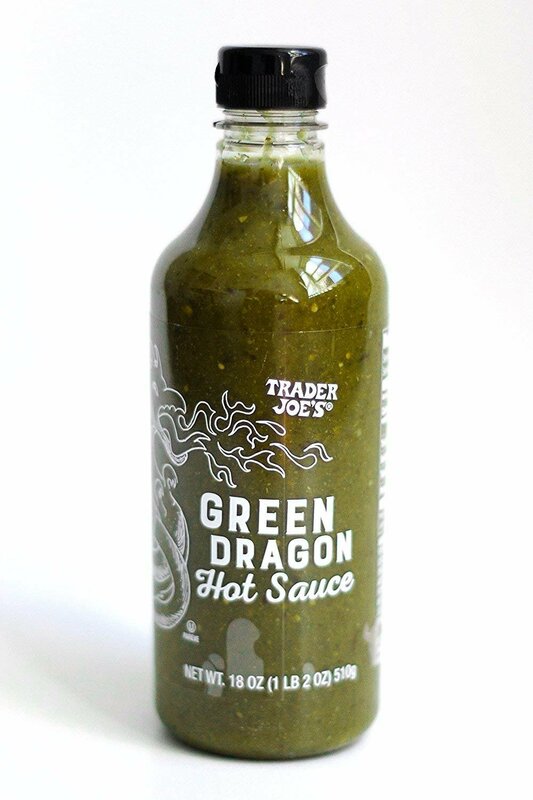 There are so many items I never leave TJ without them but I never heard or tried the Green Dragon Hot sauce.. and I’m with you – love those chocolate peanut butter cups too much so I stopped buying them for the same reasons. FrozenMashed potato disc, frozen cauliflower disc, raspberry jam, hair mask, spices, and the list goes on and on.. Discover something new every time I shop there. I need a good hair mask, checking that one out! Back off, Edward. If you pay attention and keep an open mind, you can learn something new in the way of recipes and cooking from Sue. It took me awhile to love TJ’s. But slowly I got used to it and am lucky to have one 5 minutes away. You are right, some things you just gotta have. 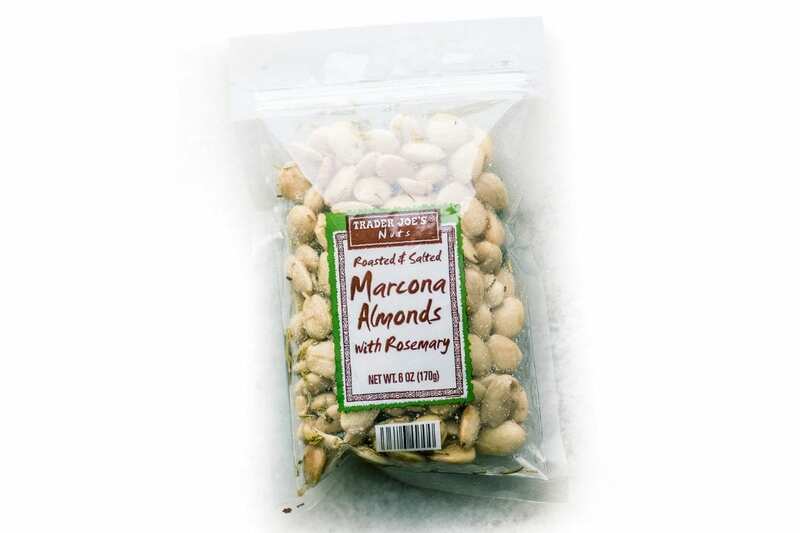 Like Marcona Almonds! Sue your diet is a health mess. It’s not easy to slowly commit suicide at Trader Joe’s but damn girl – you found a way. Edward! Why would you even think for one tiny little man-second that this was ever meant as anything more than a list? I guess no one ever man-splained this to you before. So.. Now you know.. List =list =list. OH wait! I just had an epiphany! If making a list, which includes several things that might not be totally healthy, which then Must mean everything that person cooks/consumes is unhealthy… So if I only make lists that are 100% healthy then I will be 100% healthy? That’s it? Dang Ed.. Ive been doing this wrong for 65 years! Phooey. I need more time. Hope you r at least smiling. ? I always get a bag each of their frozen mushroom risotto and frozen asparagus risotto. Heat one of those up in the microwave and mix in some leftover chicken and you have a really yummy dinner in under 10 minutes that is actually fairly low in calories! TJ’s is also the cheapest place to buy most nuts (even including places like Walmart), so, ever since reading an NYT article that documented scientific studies showing that having almonds every day drastically reduces the incidence of many medical issues, I always buy a couple of bags of plain, raw, whole almonds when I go, and stick the one I’m not ready to use in the freezer. I love the coconut strips. They’re a great snack. I love these TJ’s lists because I always find a new item or 2 to try! I always buy the frozen brown and frozen jasmine rice, salsa verde for white chicken chili, the sliced yogurt cheese (tastes like cheddar! ), freeze dried strawberries, glazed pecans, goat cheese, marscarpone, salami, bacon and seasonings like the pink salt grinder, Chile lime, garlic salt and everything but the bagel seasoning. I also love the precut broccoli! I could go on and on! I love lists too, and I agree with all your choices, the goat cheese was a staple buy for me for years. Another great item.. Even if my mouth (after damaged sub-mandibular salavary gland due to internal radiation almost 20 years ago) can not take really spicy things so I have to pour out over half of the yellow curry sauce & add honey.. The jackfruit in yellow curry sauce is really good. I like they have the rice separate. I so wish we had Trader Joes in the UK, all this stuff looks amazing! You should mention that the happy workers will open any package for you to taste. I don’t know any other store that will do that. I have 2 TJ’s close to me but the parking is awful in both. One I won’t even try to get into and the other is iffy at best. So when I do go, I stock up on nuts. 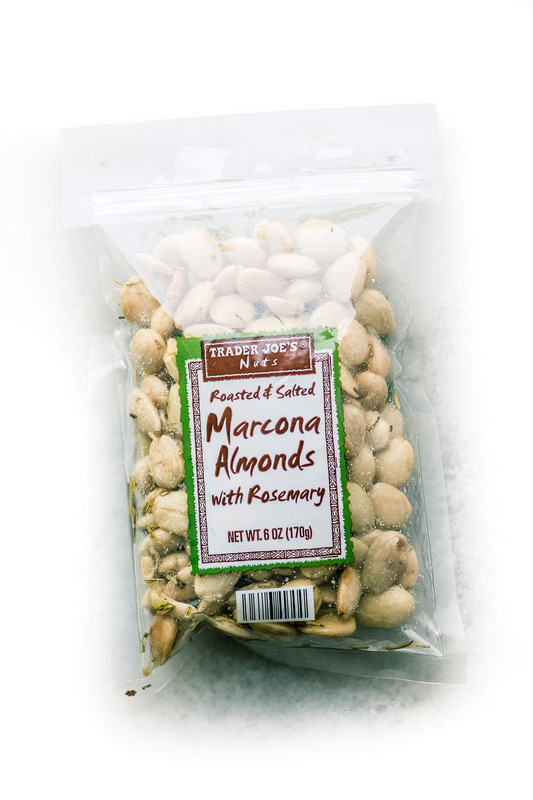 The raw almonds are good but my favorite is the almonds and chocolate! Yum! And the walnuts for baking are a must. I love their German soft pretzels in the frozen aisle. Brush with a little water and heat up in the oven. Taste like being back in munich. I don’t go to Trader Joe’s although I could easily since parking is generally not an issue in Minneapolis. What I don’t like about it is all the packaging. I have membership at a great food coop which has much less packaging and has all I need, bring my own bags. 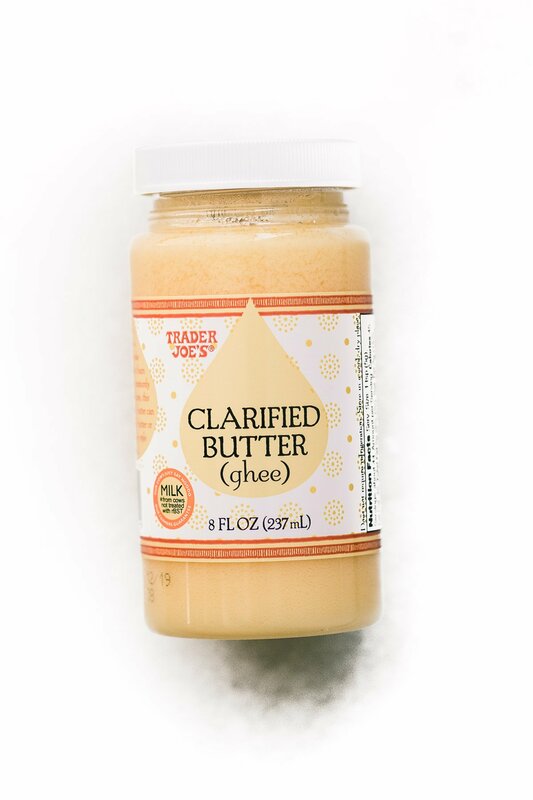 I make my own ghee. I also make my own yogurt when I realized how many plastic containers pile up, even though they are recyclable. Less plastic use! Great points. I love to make yogurt ~ and I just decided to do a post on making homemade ghee, any tips? I’d probably choose the same things if we had Trader Joe’s in the UK! Sue, I like Trader Joe’s shampoo and body wash. I love their selection of cheeses (and the price! ), the carb free cheese bites, dark chocolate almonds, toasted hazelnuts. At Christmas, I bought a tabletop rosemary Christmas tree. One of the things that I was going to put on my list was cheese for sure, any kind, their selection is fun. I also buy the rosemary trees at xmas. I wish we had Trader Joe’s over here. It looks like you can get some great things. French Roast Whole bean DECAF coffee beans because I haven’t found them anywhere else! Love your list, I need them all. We are visiting friends in the US at the end of June. Will have to take this list with me and see what I can bring back on the plane!! We love their frozen vegetarian and pork pot stickers. I buy MANY bags for quick, busy weeknight dinners. So easy to stir fry a few veggies along with it. My teenage sons are addicted to their frozen hash browns. They’d eat the whole package in one sitting if I let them. Haven’t tried the hashbrowns, but that makes so much sense, and the potstickers are one of their best products! 2. Spa face wash with tea tree oil. I just never leave the store without those 2. I do buy plants and sundries. Lots of new items to try. I will buy boxes sets of baking things just to have on hold as well. 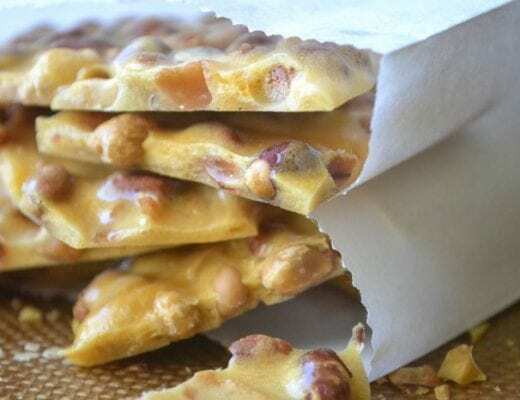 Last one I tried over Christmas were Maple pecan shortbread bar box! I just noticed the creamed honey for the first time the other day, it looks so good, what do you do with it? And yes to the Spanakopita, I make dinner out of it, one of my favorites :) Love the lemongrass chicken rolls, too, I almost included those on my list. But our family favorite is hands-down Soyrizo! My Mexican father in law didn’t even notice it was a veg option when I made it for him, and when I told him what it was after he complemented my cooking, he was shocked at how authentic it tasted. He’s now fully converted to TJ’s soyrizo and doesn’t even buy the Mexican-made pork variety any more. Great suggestion, I haven’t tried it but it does sound so interesting. It’s amazing what they’re doing with meat substitutes these days, and we need them so badly! I go to TJs on the regular and one of the many delightful products I would recommend is the Pink Grapefruit Marmalade. I make a grilled Brie and Havarti cheese sandwich with crispy shallots on sliced brioche bread with a schmear of Dijon mustard on one side and a Tbsp of marmalade on the other. The flavors together are meltingly delicious. And I sprinkle cinnamon and powdered sugar on top of the sandwich to give it a bit of a French toast twist! I could also imagine making a citrusy thumbprint cookie and using a dollop of that marmalade. omg you’ve got me drooling Monique!! I live in southern California and fortunate to have a few TJ not far away, and they are all always busy! Always purchase arugula, persian cucumbers, sesame seed oil, bocconcini (baby mozzarella balls), frozen turkey meatballs (quick meatball sandwiches), chicken, vegetable stocks. I’ve been curious about the green dragon sauce so maybe I will give it a try! The Persian cukes are great, and the arugula is one of the few bagged greens I buy there, it does seem to stay fresher better. So, after reading about these items at Trader Joe’s, I’m struck by the fact that you obviously don’t look for organic or non-GMO, as I do. And in meat or poultry, not for no antibiotics, hormones, etc. I also look for humanely raised and pasture raised, etc. and thinking about giving them up. Disappointed. That might be worth another post about the healthiest foods you can find at Trader Joe’s, and there are many, I agree. I actually don’t buy meat or fish at TJs, I haven’t been pleased with the quality, and I can get good organic/humane animal protein at my regular grocery store, which I love. My nearest TJs is 130 miles away, in Las Vegas. I couple a visit there with a stop at Total Wine so it’s a two-fer and worth the four hour round trip. I never leave TJs without their salt and pepper grinders, capers, and cedarwood spray cleanser. We are unlikely to get a Trader Joes in St. George Utah because of the liquor laws here but one can dream. I think in New Hampshire we had liquor laws and did finally get a Trader Joe’s. The cedarwood cleaning spray sounds great, I have to look for it. We have a couple in New Hampshire now and the parking is never a problem but a new one is opening soon right next door to Whole Foods and the parking lot is super tiny! We love the organic baguettes and ciabatta rolls! Oh wow, a food shopping dream/nightmare! I’ve always passed by the breads, I’ll have to give them another look. Your TJ list is similar to mine. Living near DC I have easy access to two stores in the suburbs two different parking lots both difficult. Thanks for information about cream. I used to buy baby spinach and arugula but after romaine scare I stopped because I assumed TJ used CA and AZ suppliers. Have a good farmer market nearby which can supply both. I don’t love their bagged produce, I’ve had bad luck with it, it never seems super fresh. I’m lucky enough to have TJ’s close by. My standard purchases include coconut milk, coconut cream (for dairy-free diet), dried fruit, nuts, flaky salt, beef sticks, cruciferous crunch bag salad, uncured bacon, coffee, wine, AND their awesome shopping bags. No trip to Trader Joe’s is complete without dolmas! They come ten to a can, and aren’t very expensive. It’s nice to have them on hand for adding to a cheese plate, or light meal, or when you get a surprise guest. 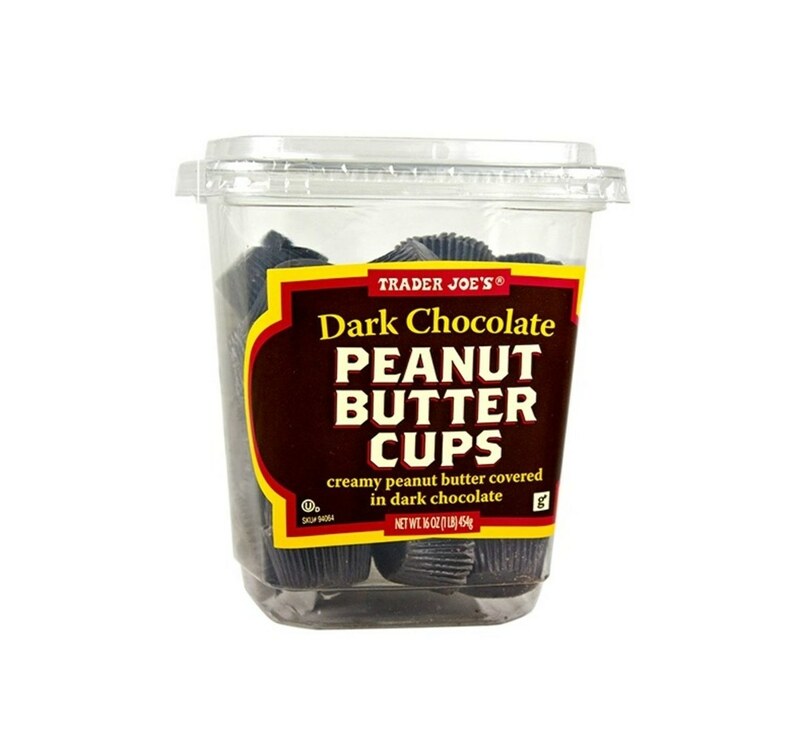 They’re inexpensive and keep in the pantry until you need them. Wait what? I’ve never seen them, I’ll check next time! Sue, I believe dolmas are stuffed grape leaves? I used to make stuffed grape leaves with lamb and rice, traditional Lebonese dish. They are so nice on a cheese plate, agreed! It’s funny that you should mention how hellish the parking is at your Trader Joe’s store. It’s the same here – I live in south Florida. You can get a parking space only if you go early In The morning, or right before they close. I didn’t know they had heavy cream that is not ultra pasteurized. I will be on the look out for it next time I’m there. I like to make cream brûlée, and would prefer to not use ultra pasteurized. I also want to make clotted cream. The things I always get are fresh pizza crusts, and I like to check out their wine section. Their nuts are the best, especially macadamia. I’ve actually heard, but it’s probably not true, that the bad parking is part of their business model! I don’t see how that could be, but it does seem to be a universal problem for them. I used to buy the pizza crusts but got tired of them…I’ll try again! I only get to Trader Joe’s about once a month because it’s about 30 minutes from my house and parking is definitely a pain. I’ve tried some of these but not all. Glad to hear your reviews so I can try some more new items!